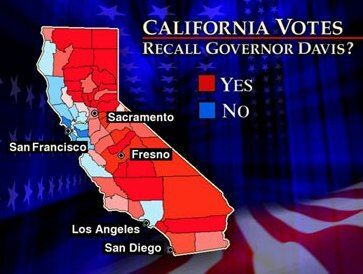 Joe Mathews has written an interesting column about the 10th anniversary of the recall of Gov. Gray Davis. “Critics of the recall said it was a crazy idea, a partisan Republican power grab, a perversion of America’s tradition of representative government. Supporters said it was the epitome of popular revolt and the first step toward the remaking of California. Love it or hate it, everyone agreed — the recall was titanic in impact. It wasn't just Republicans who were upset with his car-tax hike, his budget dithering and the sleaziness of his pay-to-play fundraising. Then-Attorney General Bill Lockyer, a fellow Dem, famously ripped Davis in summer 2003 for his “puke politics.” The president of the California Teachers Association revealed that in the governor's office on Valentine's Day 2002, Davis had demanded a $1 million donation. The bad blood between the CTA and the Democratic governor was real and intense. The CTA ended up fighting the recall. But it was going through the motions. And Lockyer joined a lot of Californians in voting for the recall and for a fresh face, at least if you look past Arnold's facelifts and fake tan. This factor goes a long way toward explaining why the 2003 recall happened. 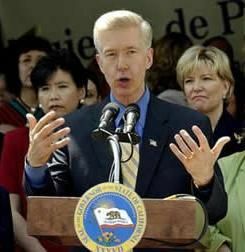 Gray Davis was a unifying figure — unifying state voters in a desire to get him out of power.